Artifex Mundi has had a strong presence on Steam for Linux since they got through Steam Greenlight last year. Last month they published their 14th game on the digital store, and as usual it was a same-day release for Linux on Steam. 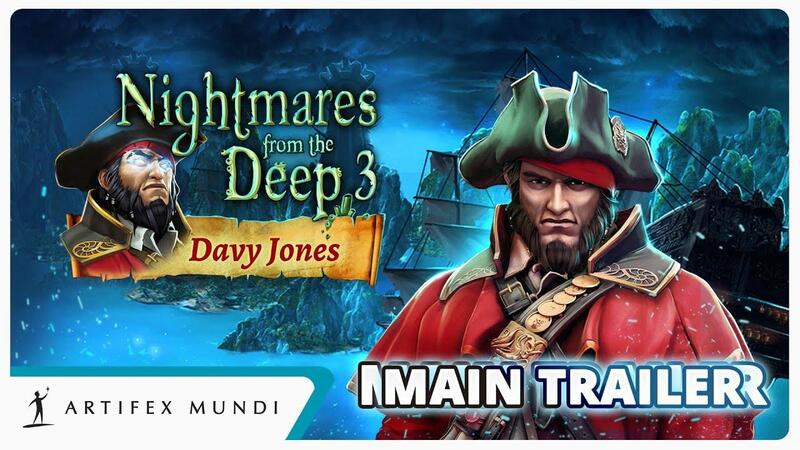 Nightmares from the Deep: Davy Jones is the conclusion to the trilogy which landed the publisher on Steam. Below is the official trailer from its release on Windows and Mac last year. Their games belong to the hidden object puzzle adventure (HOPA) genre, which is a genre that has become more popular over the last few years. So far only a few of the games have received brief mentions on GamingOnLinux, but as a reference site in Linux gaming, we would be remiss not to give this great contributor to our platform a more extensive coverage. Personally I think it's great to see the increase of casual games on Steam, like HOPAs, visual novels, puzzle games and children's games. And I think a good genre mix is important for Linux to continue to gain popularity in the future, both on desktop and on the upcoming Steam Machines. I got my own first brush with the genre through the Drawn trilogy on Windows, and since I quite liked those I wanted more. While I was looking for games like it I came across the Dream Chronicles series, but apart from those, most were too focused on hidden object scenes for my taste. And none were available for Linux. I had pretty much written off the genre last year when I came across Clockwork Tales: Of Glass and Ink on Steam, thought it looked interesting and decided to give it a chance. I was assured on the Steam forums for the game that it was more focused on puzzles, so I bought it, played it and thoroughly enjoyed it. The games are similar to traditional point-and-click adventure games in that they are focused on story and have many traditional inventory based puzzles. There's no inventory combine mechanic, but you sometimes have to manipulate items before picking them up. In addition to these puzzles there are also a good amount of puzzle minigames with plenty of variation. As the genre suggests, there are several hidden object scenes in each game. Some are just static backgrounds where you have to find a number of objects by name or shape, but some have a larger degree of interactivity in that you have to manipulate or combine objects to succeed. The stories in most of the games I've played are low fantasy mysteries, and though they aren't especially deep, I've found them entertaining. Art, animation and sound assets are all well produced and contribute positively to the experience. In an attempt to put both the genre and the developer and publisher of most of these games on Linux properly on the map, I reached out to Artifex Mundi for an interview. They were kind enough to oblige, and here's what PR Director at Artifex Mundi, Szymon Bryła, had to say. Your self-published games have all had same-day releases for Linux on Steam. What were the deciding factors for you in pursuing Linux as a gaming platform? The deciding factor was the Linux fan base and that means you, guys! During the Greenlight process on Steam, while trying to get votes for Nightmares from the Deep: The Cursed Heart, we have received many questions about Linux. I have to admit that Linux version was not a part of our publishing plans initially, but then we discovered that our titles are of such a great interest to [your] community and decided to give it a try! Without your support, the road to getting greenlit would be considerably longer. Thank you! How have your games performed sales wise on Steam for Linux compared to Windows and Mac? Windows is definitely leading when it comes to numbers. The differences between Linux and Mac are marginal. Currently Steam is the only option for buying Linux versions of your games. What are your thoughts on offering DRM free versions for Linux; either from your own website or DRM free platforms like GOG, Desura and Humble Store? We are not huge fans of DRM and we don’t implement this solution into our games. The majority of our games is available on Steam (some of them also on Desura) mainly because (according to our observation) the Linux community is numerous and very active precisely on those platforms. This is why we are focusing so much on Steam these days. Also we don’t rule out the possibility of trying other platforms like GOG in the future. As someone who grew up with classic point-and-click adventure games and have played several of your games, I find that I liked the ones that have few hidden object scenes and are more oriented towards solving puzzles the most. What kind of feedback have you received from your audience on this mixture and do you feel like it's a balance that you're still figuring out as you release new games? Our fans have a really huge influence on our titles. We’re always curious about their opinions and ideas. At the same time we’re working hard to make the HOPA genre evolve, by adding original solutions and improvements. While at it, we’re striving to keep a certain balance when implementing new features, hence less hidden object scenes and more puzzles in our latest releases, for example. Some claim that cinematic adventures, like Quantic Dream's 'Heavy Rain' and Telltale Games' 'The Walking Dead', and hidden object/puzzle adventure games are both natural successors to the classic point-and-click adventure genre. How do you feel about this and why do you think these genres have a wider mainstream appeal? The classic point-and-click games are the actual predecessors of contemporary HOPA games, which are based on elements taken from classical 90’ adventure games, enriched and modified to cater to present-day needs and expectations of gamers. The market success indicates that this formula is working and everyone’s pleased. The common factor behind Heavy Rain’s and The Walking Dead’s successes are the characters, their relations and the story progression based on player’s decision making. The visuals – although important – are not critical here. In case of Telltales’ production it was mostly the popular license and the rise in popularity of zombie genre that translated into such a success. The engine used to create your games, Spark CE, supports a wide range of platforms, including Linux and Android. Yet the editor is only supported on Windows and Mac, according to the documentation on your website. Is a Linux version something that you've considered, given that it would both make it easier to build and test for Linux in-house and also provide a native option for prospective developers who are Linux users? If not, why not? Correct: our engine is multi-platform in nature. This is why, for example, the Mac and Linux versions are always available together with Windows on Steam. Last year, however, we put licensing Spark on hold. Should we ever resume this, we will definitely let you guys know! Thanks to Szymon Bryła for answering my questions and to PR Specialist Łukasz Ślipko for facilitating the interview. They also generously provided Steam keys for their latest game that we will give away to three readers. For a chance to score yourself a Steam key for Nightmares from the Deep: Davy Jones, simply let us know what you like about the HOPA genre in the comments. Submissions will be open until Friday 20th February at midnight UTC, at which point we'll draw three winners who will get a Steam key each. I've enjoyed the Artifex Mundi games that I've played (there was a Humble Bundle for them awhile back, I believe), but I'd love to have some more games from them that aren't absurdly supernatural in nature. After going through a few of them in a row, I grew pretty exhausted by the spirits/ghosts/monsters/whatever being an inextricable and arbitrary part of the stories. I'd love a series that went far more in a Scooby-Do kind of direction where the seemingly-supernatural stuff just turns out to be some jerk putting on a show. I think it bugs me more here just because the nature of the games are so arbitrary and abstract anyway that having the plot further push it in that direction just seems a bit much. Davy Jones is the only Artifex Mundi's game on Steam that I don't have (yet) and I loved every single one of the ones I played so far! It started with incidentally getting Nightmares from the Deep: The Cursed Heart and I must say I was rather flabbergasted about the gameplay. I expected a point-and-click adventure, and I was faced with first-person-perspective, mostly-static and beautifully drawn adventure with a pretty swell story interwoven with pretty entertaining puzzles. That made me eager to try the other ones and in every single case I found it hard to stop playing just because it was late in the night and I had duties to attend in the morning. The stories have been captivating, the graphics beautiful and the overall experience well worth it. Of course not everything is perfect, for example I am rather annoyed that it's not possible to get all achievements at the same time (in particular: it's *either* hidden object scenes achievement *or* mahjongg achievement in Nightmares from the Deep), also 3D animations found in some of the games are rather poor, but those are not dealbreakers, just minor nuisances well covered by overall quality of the experience. I finished Abyss: The wraiths of eden a few days ago… I liked it but the story didn’t hook me much, it’s a bit bland. Personally I like the hidden objects scenes probably more than the rest. BTW the French translation has many errors which makes finding some objects rather difficult if you don’t know the translation in English… (For example they translated "spring" to "source" instead of "ressort", or "hand" to "main" instead of "aiguille".) But other than that the graphics are very good and the games are technically flawless. These games are wonderful time-wasters (in the positive sense). But the actual reason I enjoy HOGs and HOPAs is that my wife loves 'em, and likes playing them with me. Yeah, I'm whipped, and that's okay. I'm into puzzles and not hidden object stuff, but I know somebody at my LUG who likes both and will probably be very interested in this article. Actually, I do have one of these games on my own playlist, Clockwork Tales: Of Glass and Ink, so I'm glad to hear there is more puzzle than hidden object. Don't need a Steam key since I already have all their (on Steam) games. Just wanted to say that I love these guys from Artifex Mundi. Nightmares from the Deep: The Cursed Heart was my introduction to Artifex Mundi games. To be honest I wasn't expecting too much from a hidden object/puzzle adventure game. So from that day on I started buying all the Mundis games. Nightmares From The Deep: Davy Jones is the only Artifex Mundi's game that left to complete my collection. Thanks Artifex Mundi for bringing your games to Linux!!! HOPA fulfils my OCD desires to click and hover over and read everything. dubigrasu Don't need a Steam key since I already have all their (on Steam) games.